A natural transparent brownish green glass found near the Moldau River in Czechoslovakia. There are two popular theories as to the origins of moldavite - one is that it arrived on this planet in meteorites, melting as they passed through the atmosphere. 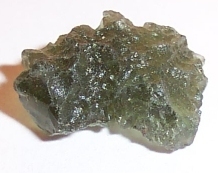 Others believe that the impact of a large meteorite caused the surrounding rocks to melt and scatter, creating moldavite. Moldavite is considered to be in tune with the energies of the cosmos and more capable of raising our energies to a universal level than most other stones. It is used for protection from evil and to improve clairvoyance. Moldavite opens up your whole being to finer energies.